Waddell Media's popular travel show ‘Francis Brennan’s Grand Tour’ is set to return to RTÉ this Sunday night, July 22th. 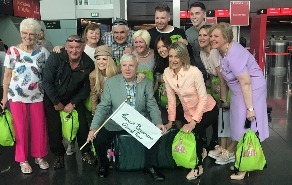 This season will see the production team travel to South Africa, where Francis Brennan took twelve paying tourists on what they hope to be a surprise trip of a lifetime. ‘Francis Brennan’s Grand Tour’ is directed by Evan Chamberlain, the series producer is Maggie Gibson, and Edit Producer is Sarah Reddin. Cameramen on the series are Dave Perry & Michael Quinn, Sound was done by Mark McMaster, Editor on the series are Paul McFarlane, Marc Kirkbride, Brendan McCarthy, and Ian Courtney. "Working with Francis is such fun; he really is just as he appears on screen. We were on location together 24/7 for 14 days and he was always at the top of his game. Francis is inspirational to work with, he has huge energy levels and we did have lots of laughs together. "It is not an easy shoot with very long days and 12 guests who have paid for a holiday of a lifetime experience. The production team is carefully handpicked, they know from the get go that it is going to be hard work but we all get on really well together and it is a privilege to work with them. I owe them lots of meals and beers!" The series kicks off with Francis’s guests gathering at Dublin Airport where their mystery destination is revealed – South Africa. Francis has organised a thirteen day epic tour starting in Johannesburg, where they visit Soweto, before heading south. In the Eastern Cape they experience an once-in-a-lifetime safari experience, followed by a drive down the world famous Garden Route (with a surprise bungee jump) ending up in beautiful Cape Town. ‘Francis Brennan’s Grand Tour - South Africa’, airs on RTÉ One this Sunday July 22nd at 8:30pm.